In the previous sections of this series I covered the heart of your investment, the input devices that are critical for any serious digital artist and the workstation which allows you to do strokes without a lag. Even if these devices mentioned above are the more important aspects to worry about, the display is mission critical as it is not only responsible for picking the right colors and with that the outcome of your work perceived by others, it also decides if you will have a strain on the eyes over a timeframe of 8-12 hours a day - and as a result health issues over the timespan of years. While the other articles are rather broad in terms of research and information, I will keep the overview in this article rather short. The reason is that I can only speak from my own experience and give advice based on that experience. And since I don´t get paid to test monitors this advice is subjective but honest. To start with, I mention my display of choice here first and go on about pros and cons of alternatives. The main monitor I use is a NEC Multisync LCD2690 WUXI. Once you work with such a great device, you won´t go with anything cheap, really. This display is in duty for around 8 years now and it still does so with grace, do I need to say more? Well, lets start with the bad things first; the only thing to bother is that it is only 25,5" big. And yes, the other reason to nitpick is the pricetag of 900-1.250 Euros. It also is not usable for playing games. And that´s it - nothing more to bother. 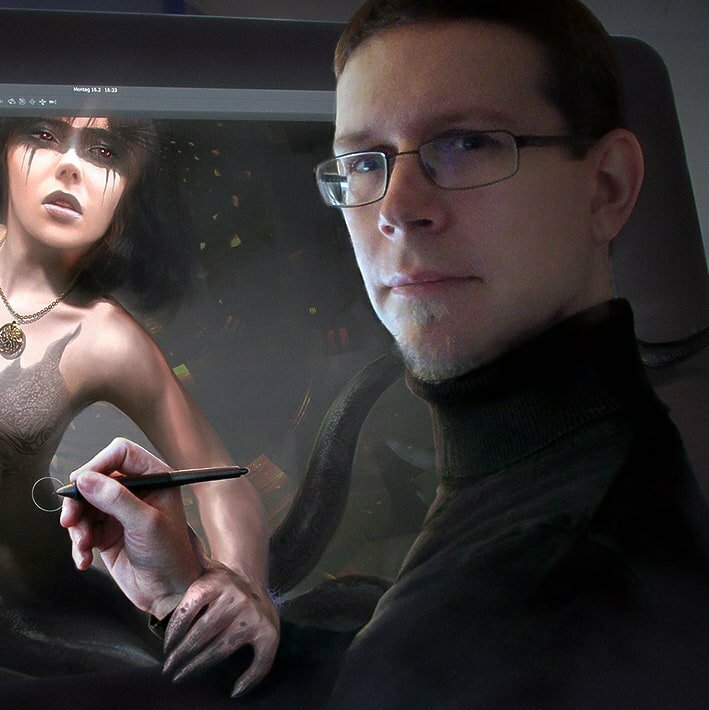 You can read the review on trustedreview or on PRAD here, you will not find anything better for digital painting. It also may be cheaper right now but even then I recommend getting the 30" NEC PA302W-BK for as low as 1800 Euro if you have the space on your desk. That would be my next choice if I ever have to replace my beloved 26" NEC. In displays, you will not be able to get an allrounder. 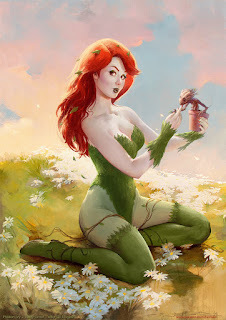 Especially if you are looking to have something for gaming and digital painting - simply forget it. You either have a professional display that is a pleasure for the eyes - that is expensive. Or you have a cheap gaming device that will only be used 2-5 hours a day without a pain. The same rules that apply for graphics cards, as mentioned in the hardware article #2 apply to monitors - the more you use it for gaming the more power it CAN consume and the less reliable the hardware has to be. If you work in a professional environment you want to save energy, reliability and don´t want a strain on the eyes after a few hours. Save energy, prevent eye strain and give yourself the best canvas possible! There are even more critical points to address than these, but when you look for reviews or products that feature these points you are in the professional alley. If you look for a NEC, EIZO, Quato or LaCie you are surely on the rather expensive side but reviews of these monitors speak volumes. What´s up with Apple´s Thunderbolt displays? There are thousands of options but there are a few things that come to mind and since Apple is a company that has developed workstations for designers in the last century but unfortunately not anymore..., it comes to mind that the Displays could be any good. The first reason is the power consumption: 250 Watts for a 27" TB display is way too much, without eco-mode turned on, the NEC does have a consumption of 75 Watt and that is a number to go by. It is manufactured with an LG display that is rather budget. And if you think you would do something good with an old Cinema dsiplay 30" that has Display Port think twice, that one does consume up to 300 Watt - no joke! There is a reason why it isn´t produced anymore. What about Wacom´s Cintiq devices, especially the 24"? The same that can be said about the budget displays of apple can be said about Wacom. Sure, you think you shell out around 3000 bucks for a 24" Pen Display, then it should be possible to double use it as a monitor right? Right but only if it has not to be color-sensitive, lets say for print. Wacom also don´t use hardware-color-calibration let alone color profiling. The Wacom H-IPS Panels (also produced by LG) are able to reproduce sRGB to a good extent which is great for creating content, but not for color sensitive reproduction. So in my opinion it is good for you to have a reference monitor to check colors and contrasts on color-critical artworks. For this you can also use a 19" or 20" professional display to save some bucks, but do yourself a favor and rather sepend 400 bucks for a NEC or EIZO opposed to a bigger budget Display that only does look good. The only thing good about the Wacom displays is that they use good IPS panels that don´t hurt on the eyes when working longer episodes. The new 27QHD device from Wacom lives up to some standards which means 97% of Adobe´s RGB and more accuarcy with a colorimeter which has to be obtained separately, but at least they´ve listened. Way to go with hardware calibration and 4k. What´s up with HDTV or Ultra-HDTV that was recomennded to me? 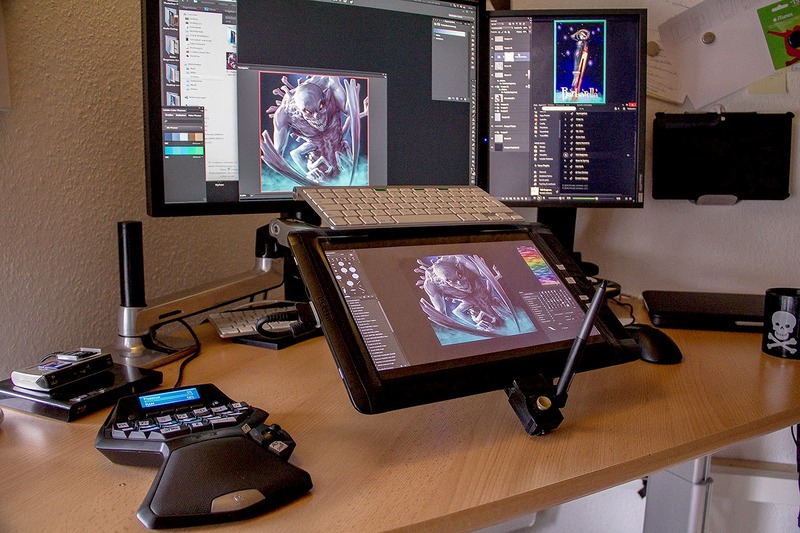 Aaron Rutten posted some useful information regarding the setup for digital painting workstations back in March 2013, in general this information is useful still to date. However the recommendation of the HDTV is sketchy. I get that it is useful for getting a grasp of both worlds, what the end user will see and the screen real estate, however, these consume power in the range of 250 - up to 700 Watt. Nice for an hour of entertainment, but I won´t pay that powerbill when a 50" panel runs for 10 hours a day. As a photographer you have a lot more trouble with colors so a color spectrophotometer is in order. However, when working directly in Photoshop or the likes, you create content directly on the monitor, so the monitor is your canvas that is the reason I recommend nothing less than a professional device. I don´t say you don´t need a hardware calibration tool when you own such a display, but as a digital painter or illustrator you won´t need it that much - the reason for this is more explained in depth in the upcoming part of this article/series; printing. Your canvas has not to be perfect as output material, whether digital or print, isn´t perfect as well, on web you have rgb/srgb and in print your color space will be reduced to 4 colors or less. So my suggestion is to go with an ex factory hardware calibration and to do a manual calibration with your printer or a variety of other displays for web use on a regular base. With the rise of 4k and 8k television that is pushed by Intel, I see 4k displays that are affordable coming up in the near future. That is the reason I want to keep my beloved NEC as long as possible so that the next investment is a 4k 30" NEC Display, who knows. Read your Cintiq27 review which was very helpful and landed on this page to have a go on your 2690 review. The Nec 2690 is/was a great display, but most likely than not shares the same LG IPS panel, as LG Display is the only one around anymore who manufactures IPS panels. You can check out TFTCentral's panel database. Same goes with Eizo's IPS models. So the difference with the Apple display is not as much the panel itself, but the electronics and the (lack of) calibration options which you mentioned above. The most important issue with the apple displays, for professional use, is the fact that it has a glossy surface,with all sort of reflections like Samsung's consumer models. Displays for color critical work either from NEC, Eizo or deceased Quatto always came with great calibration options, a matte/ anti glare surface and a hood. Thanks for your comment and glad you found my article helpful! Also great to meet someone who knows something about screens. However, while the Information in TFTCentral are right, I´m afraid the model I´m using is not listed, only the WUXI 2 and WUXI-2 BK and since I ordered the WUXI-2 some 5 years ago or so for use as a second display, the quality of the panel never came close to what the original WUXI does have. As I mentioned portrait mode was not bearable as havn´t seen anything much like with any TN display when used in pivot mode. In fact I don´t know what panel is used in the original WUXI model, even PRAD.de does give no information except they say it uses a Advanced True White Polarizer Horizontal IPS' (H-IPS A-TW Pol.). But I agree totally about the glossy surface on the apple, I believe gloss is what sells better and additional adhesive protection sells too. Hi. This was a very Insightful article. Thanks for taking the time to write it. 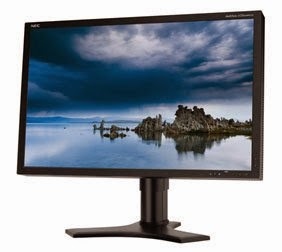 I'm currently looking for a new monitor, my current one is Lenovo L220x. A nice monitor but not an IPS panel, its a PVA. It is supposed to be wide gamut and support 94% of sRGB and 93% of Adobe RGB. Though I could never get it to display colors quite right. I've tried calibrating with a Spyder 2 shortly after getting it. Then eventually tried a borrowed spyder 3 and Color Munki to no avail. I can't really fit anything larger then a 24in in my workspace. So I'm a bit restricted. I was looking at the ASUS PA249Q. Its supposed to an AH-IPS panel and wide gamut, supporting 100% of sRGB and 99% of AdobeRGB. Seems to fit the bill. Do you happen to have any thoughts on this, or any other suggestions. Any help would be greatly appreciated. Again, awesome site and work. Thank you. thanks for your positive comment, much appreciated. Hi. Thank you so much for taking the time to respond. I di not get to answer back to to some sudden tight deadlines. However, now I'm ready to get ready to buy my monitor. I looked into the NEC. But it looks like that one only covers 78% of Adobe RGB. Still considering the Asus since the people in that posting seemed to have worked around the issues in calibrating. Though I did cone across another contender. I found the HP Dreamcolor z24x. I can be had for a little less than the NEC and has a 10 bit AH-IPS panel and covers 100% of sRGB and 99% of adobe RGB. Seems pretty good. But I could not find it on Prad.de. Do you have any thoughts on this? Thanks again. Just to add a note on Carlos question, it is actually more important to get a proper colorimeter & software bundle along with your monitor rather than just a good monitor, because all of them need frequent calibration, unless you get the Eizo that auto calibrates on its own. In the 27" range the 4K LG 27MU67 as well as the Eizo CS270 are both great choices. In general I trust the Prad reviews but this one is a bit shady. Yeah, the NEC PA322UHD is a beast, with double the price of the LG too. Your post alarmed me, so I did a quick check with nvidia that shows even the lower gtx960 model supports 5120x3200 Maximum Digital Resolution and I'm sure equivalent AMD desktop models do the same, so no need for Quadro or FireGL cards. As for true 10bit workflow, this is the same for all models, irrelevant. Only the pro range Quadro &FireGL have this feature unlocked (in the past even "gamers" cards could do it, but they disabled it). Non the less through emulation one can "see" the effect, because lets not forget that very few panels are true 10bit, most are 8bit with 10bit conversion electronics inside. Evan, if you want a good mix of both, workstation and entertainment, the LG is probably the way to go. I´m sure a lot graphic cards support that resolution. For a workstation (and that is what the post originally was about) 10bit is not irrelevant. At least if you count the difference between 16,7 million colors and 1.08 billion a lot. Sure, in everyday use, the advantage is minimal, but I would consider the colorimeter and spectro-software useless if someone does not make use of a 30-bit workflow. I see it as a whole package and if one component is missing due to a lack of knowledge, the whole package could be a lot cheaper to begin with. I do make use of the workflow and it makes a lot of sense when you draw directly on the surface as with the Wacom 27QHD. Hi Oliver great article thanks for sharing. I was looking at the picture of your workstation and was wondering what the device was in the lower left corner of the picture? The thing with little buttons and a screen at the top displaying RAM. Is it an alternate keyboard of some sort? Thansk in advance.